Loyola men’s and women’s cross country teams got the season off to a fast start, as both teams took first place at the Four Points by Sheraton Wolfpack Invitational last Saturday. This marks the third consecutive year the women’s team has taken the top spot at their home event. The team scored 46 points, 17 points ahead of runner-up Xavier, with an average time of 20:23, and finished with seven runners in the top 25. Sophomore and co-captain Vanessa Righeimer was the top collegiate runner for the women, coming in at fifth overall with a time of 19:56.02. The men’s team took top honors, scoring 46 points, seven ahead of runner-up Mississippi College, and finishing with an average time of 16:40.49. The cross country team will return to action Oct. 1 at the Gulf Coast Stampede in Pensacola, Fla. Coach Andy Canegitta plans on picking up the practice tempo as he eyes to finish every meet like the one last weekend. 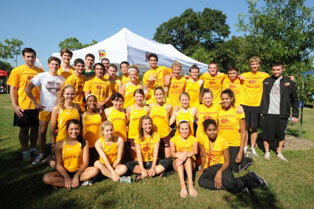 For complete meet results of last weekend's event, please see http://wolfpack.loyno.edu/track/loyola-wolfpack-cross-country.